i was going through some photos looking for one in particular to post for this week’s “life on location.” i found it, but i’ll post it next week. instead, how about this one? 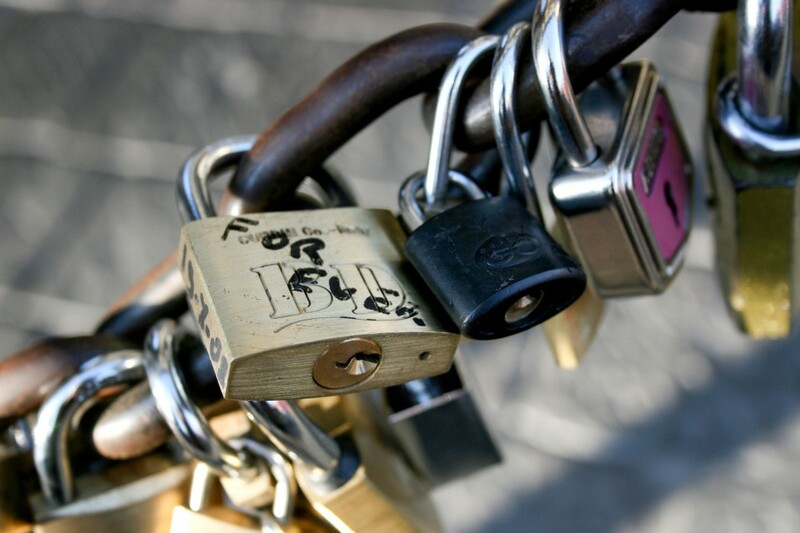 these locks are from florence, italy, right around the corner of ponte vecchio. if you click that link and look the photo, these locks were more specifically from that columned hall directly to the right of the bridge. the first time i had seen locks all locked up like this was along via del amore in riomaggiore. it was fun, and played right into my love of all things graffiti & street art based. i thought it was some romantic tradition specific to that spot, but then i saw these in florence, and thought it must be a european phenomenon. but, i most recently saw some on the brooklyn bridge. so what’s the deal with the locks? well, i did a little googling and came up with a few things. go here , here and here . think about how cool it would be to visit a place and see locks left by your parents or grandparents?? swoon. i love this idea, and it make’s me wanna go buy a couple metal locks and some sort of engraving tool. you know, just in case i ever need it.